1-month minimum *. This two bedroom, two bathroom ground floor apartment offers an especially lovely garden view from the spacious screened porch and a peek-a-boo of the bay. King-size bed in the master bedroom and a queen-size bed in the guest bedroom. Televisions in living room and the master bedroom. Coin operated laundry just steps away. All of our interactions were good! Barefeet Rentals was easy to work with, very responsive and made the whole rental experience a pleasant one! We really liked the unit. A few things had to be addressed, like the shower drain and the sink faucet, but it was taken care of promptly. We didn't find the furniture very comfortable, though. That was a drawback. Also, the fact there were no drawers for clothing was a little annoying. This bayside condominium property is one of the more quiet and most beautifully landscaped in the Key Largo area. 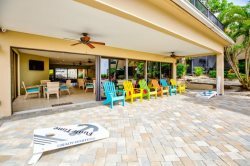 Lush tropical foliage, a private, sheltered sandy beach, heated pool, tennis courts, and those lovely Florida Keys sunsets make it a perfect choice for a relaxing Keys Vacation. Rental includes $150.00 cap on utilities monthly. Charges over this amount will be deducted from the security deposit prior to refund.